...monkeys. Well, at least that is according to a blog post on Scientific American. 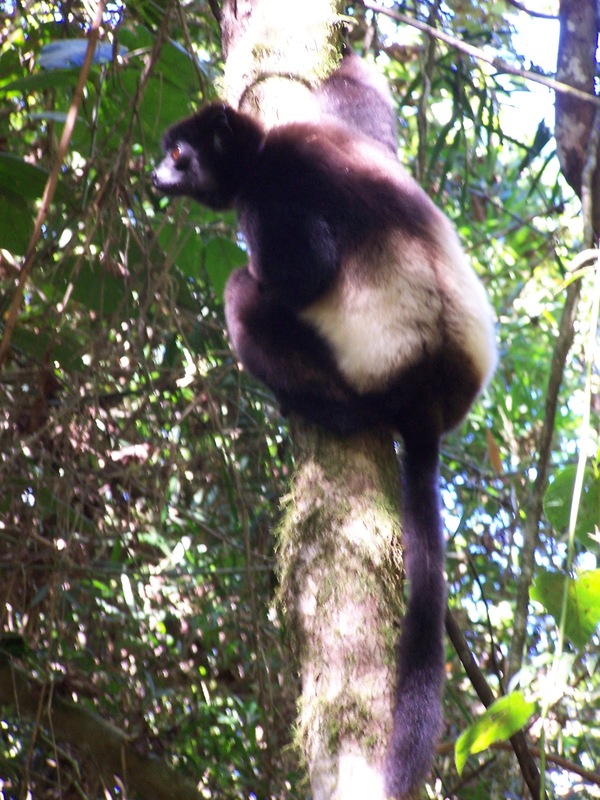 And, in fact, the monkey in question is specifically the black-handed spider monkey (and not the lemur to the left...), which lives in Central American forest canopies. Why is the blog post author's cuppa joe killing this monkey? Not surprisingly, the destruction of forest for coffee plantations (probably in addition to all the other multitude of drivers of deforestation) is at the heart of the matter. But besides the coffee bean threat, the article gets at the deeper issue - be it coffee in Costa Rica, oil palm plantations in Indonesia, or mining in Madagascar - global economic demand for commodities drives habitat destruction and ultimately threatens cute, fuzzy, charismatic megafauna. Ok, I'm not advocating for everyone in the world to stop buy 'stuff.' But at its core, this article is actually about the loss of species. The author argues, "this loss of biodiversity may be the single largest environmental change we humans are foisting on our home planet, outpacing even climate change." So, going back to the coffee example. Standards, such as those employed in certifications like Rainforest Alliance, are presented as the only option currently available for gaining information about the ethics of your coffee. This may have some grain of truth, and Rainforest Alliance does promote both ecosystem health and social wellbeing. But more importantly, it feeds into one of the author's main solutions - you know, just revamp corporations so that they are socially and environmentally responsible. Some companies are starting to do this (such as Starbucks and Nestle) with Business for Social Responsibility, or assessing their impact with an Ecosystem Services Review (pioneered by World Resources Institute and the World Business Council on Sustainable Development). Thanks for this, Rachel. It's easy to read these things and feel overwhelmed or pessimistic, but in my opinion, these articles simply empower me, as a consumer, to demand better solutions from companies whom I'd like to keep supporting. Thanks for the realistic yet passionate perspective!